UPDATE (6/4/18): City officials confirm that no other candidates submitted petitions to run for commissioner before the 4:30 p.m. deadline. We will know for certain at 4:30 p.m. today, but it appears that only three candidates have thrown their names into the hat for the two commissioner seats that are up for grabs this summer in Rehoboth Beach. As of Friday afternoon, Donna Moore, election ex officio, confirmed that she had received nominating petitions from Richard Byrne, Patricia Coluzzi and Gary Glass. Glass has already scheduled his first meet-and-greet for Saturday, June 16. Please e-mail him for details. Neither of the other two candidates have announced any public events as of yet. Richard Byrne, Patricia Coluzzi and Gary Glass are candidates for the upcoming 2018 municipal election. Photos courtesy the candidates. 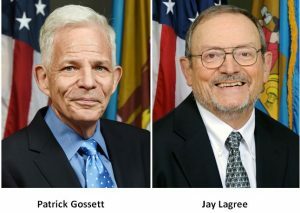 Current Commissioners Patrick Gossett and Jay Lagree both say they have decided not to run for reelection in the upcoming 2018 municipal election. “I have served as a City Commissioner for a total of nine years and as a Planning Commissioner for nine years, for a total of 18 years of service to the City of Rehoboth Beach,” Comm. Gossett said. “I think we have accomplished a great deal in those 18 years, preserving what is best in our City while providing for sensible growth. Perhaps our greatest accomplishment in those years was the hiring of our City Manager, Sharon Lynn. I am proud to have been the Chair of the Personnel Committee and led the search that hired Sharon, and she has proven to be an excellent City Manager. But now it is someone else’s turn to be at the Commissioners’ table,” he added. “To do the job right is a full-time job,” Comm. Jay Lagree said, noting that the job takes away from his other interests.